Returning servicemen swelled the number of available players as the 1946 Southern League expanded to eight teams within two divisions. The Regina Clippers, playing at a consistently high calibre from start to finish, had the best regular season record and swept the Moose Jaw Canucks in three straight contests to capture the playoff crown but only after adverse weather conditions forced the clubs to play well into the first week of October. John "Smokey" Reynoldson, a prisoner during the war, was back from the European front and pitching for the Moose Jaw Canucks of the Southern League. Fans in Southern Saskatchewan fans felt deprived as a snowstorm wiped out an opportunity to watch a touring team of major-leaguers in Moose Jaw. The game had been sold out. The June 25th edition of the Saskatoon Star-Phoenix reported that seven members of Spokane's Western International League class B baseball club met their death in a flaming plunge of their chartered cross-state bus. July 13, the Regina Leader-Post carried an item on Mary "Bonnie" Baker, former Regina Bomber catcher. Baker was reported to be the leading hitter in the All-American Girls Baseball League. Playing for the South Bend, Indiana Blue Sox, Baker had an average of .318, a lead of 12 points over her nearest rival. The 39th annual Midnight Sun Baseball Classic in Fairbanks, Alaska, had a Canadian flavour. In one of the closest duels in the history of the event, the Edmonton Yanks upset the Ladd Field team of Fairbanks 4-3 in ten innings before a crowd of 2,000. But, Ladd Field came right back in the bottom of the 9th as Lon Battles drove in two runs with a double. Edmonton's Birchfield came through in the extra frame with a scorching single to right to plate the winning marker. Wiseton captured the championship of the Saskatoon Exhibition Tournament and the J.F. Cairns Memorial Trophy with a 4-0 victory over Viscount. A crowd, estimated at more than 6,500, saw Reinie Kembel fired a four-hit shutout for the title. A young hustling ball club from Sceptre won the $300 first prize in the Medicine Hat Kinsmen baseball tournament by turning back the city's Tigers 6-0. Big star in the Sceptre win was Cliff "Jake" Jacobson, star hurler, who pitched 18 consecutive innings of baseball in two days against the Medicine Hat Tigers and Picture Butte to ring up 6-0 and 4-0 shutouts. At Huron, South Dakota, in a seven inning baseball game, yes baseball, June 10th, Huron's Junior Legion nine rang up 59 runs in demolishing Flandreau 59-3. They did it in just 56 official at bats, scoring 16 times in the first inning to put the game out of reach just minutes after it began. Huron took advantage of 18 walks and 27 Flandreau errors. And, they ran wild on the bags, with a total of 32 stolen bases. 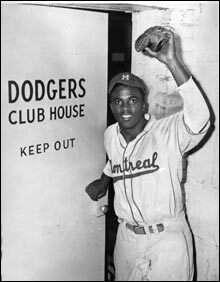 On the afternoon of Thursday, April 18th, 1946, Jackie Robinson took the field for the Montreal Royals at Roosevelt Stadium at Jersey City. It was the opener of the International League's 1946 season and it marked the beginning of the end of segregated baseball. Robinson's stunning entry into organized ball broke a colour barrier which had existed for nearly fifty years. Facing incredible pressures, Robinson made it look easy with four hits, one a three-run homer, four RBI and two stolen bases. Remnants of a crowd of more than 25,000 almost pulled the shirt off Robinson’s back as the game ended as the young second baseman was kept busy for several minutes shaking hands and autographing score cards. Robinson's impact on baseball, sports in general and society ought not to be underestimated. His ability and courage opened many doors. Strode (left), Robinson (centre), Washington (right) in 1939 at UCLA. 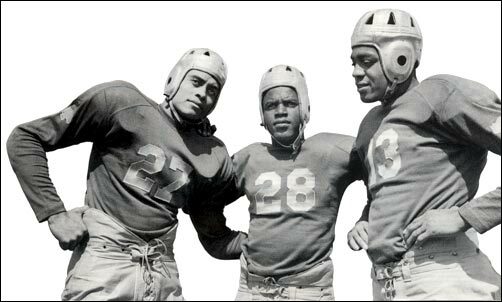 Robinson's football teammates at UCLA, Kenny Washington and Woody Strode, suited up for the Los Angeles Rams in the fall of 1946 to be the first black players in the NFL since a ban was imposed in the 1930s. Strode later played football in Canada with the Calgary Stampeders before embarking on a career in the movies. Washington's son, Kenny Jr. played in the Western Canada Baseball League with Saskatoon and Edmonton in the 1960s. Check Sports Illustrated, October 12, 2009 issue, for Alexander Wolff's article on the integration of the National Football League.